Android Platform Growth Trends Downward for 4 Months, But Why? Why has Android platform growth fallen four months in a row, while iOS accelerates? Google’s Android platform owns a huge portion of the smartphone market in the U.S., accounting for almost 59% of all types of smartphone users according to recent IDC estimates. This compares well to Apple’s iOS market share, which is somewhere around 23% by those same estimates. But there are some interesting, if very early, signs that Android growth might be taking a bit of a hit in the U.S.. Asymco’s Horace Dediu has charted platform growth across the four majors — BlackBerry, Windows Phone, iPhone and Android — over the last two years, since January 2010. The chart shows that this is the first time that Android has displayed a consecutive drop in growth for 4 months in a row. 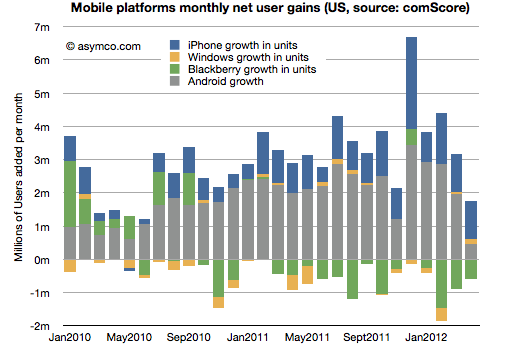 The platform had never more shown a ‘net negative’ in user gains for more than two months consecutively. Note that this is not ‘platform share’, which is a different number, but the amount by which Android is growing overall. The source for the numbers is Comscore. Now the growth of a platform is an interesting metric. It’s more a matter of momentum than overall power, as a market share number might be. This data about a possible shift in momentum for Android sparks some interesting thoughts, including a couple of standouts. The iPhone is now available on many more carriers, and has launched on several new ones in the U.S. over the last four months. Launching on more carriers gives more people access to the iPhone, bringing the choice to purchase an Android phone head-to-head against Apple’s devices for the first time ever. The tendency for carriers, like AT&T and Verizon, to sell a majority of iPhones when both Android and iOS devices are available, is telling. Simply put, if people have a choice of an iPhone and an Android phone on their preferred carrier, the majority pick iPhone. On carriers where Android devices were previously unopposed, this is bound to make a dent in sales and therefore, growth. The larger portion of the market is untapped. 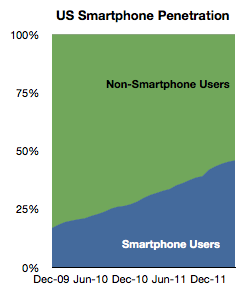 If I had a nickel every time a simpleton said that Android was ‘eroding’ iPhone market share, I’d be a rich man. The above statistic — which displays that many will pick iPhone, given the choice — is one thing. But there’s another factor. The fact of the matter is that smartphone saturation has yet to hit the 50% point worldwide, something it should do later this year. This means that half of the people in the world who have shown that they’re interested in owning a cell phone still don’t have smartphones. The potential market is immense, and iOS and Android should both be seen as reaching out into those unclaimed territories far more than they’re ‘converting’ existing users from one platform to another. Not that this kind of cross-pollination doesn’t happen, but both platforms are growing into the untapped regions far faster than they’re eating away at each other. The Galaxy S III is launching soon. One possible explanation for Android’s slowdown is the lack of a flagship device with cachet in the quarter. There have been some other launches, like the HTC One X, but they’re new brands, without a current toehold in the buyer consciousness. The Samsung Galaxy S is the closest thing that Android has to a ‘rockstar’ device with any sort of mainstream name recognition. While I don’t think that the Galaxy S III will have ‘iPhone-level’ success as a single model, it’s probably going to give the overall platform a bump in growth. The Galaxy S II has sold over 50 million units so far, that’s not shabby for a single Android model. Don’t panic, but stay alert. It’s really early to think of this as a permanent or long-lasting trend, but it is the biggest downward streak we’ve seen yet for Android. It’s an interesting factoid for now, but will absolutely be a statistic to watch in the future. Even as Android is sure to grow as a platform for a long while yet, the slowing of its pace is an interesting statistic. Android’s importance to Google is largely based on volume, because its system is completely based on delivering ads to its users. The more Android devices there are out there using Google’s services, the more portals it has to push out ads to eyeballs. With Android a volume game, total number of units is far more important to Google than it is to Apple, who reaps a huge percentage of the industry’s profits based on selling devices that make it money. Apple has to sell far less devices to make a lot more money than Google does in mobile. Speed of growth is an important metric for Android, and one we should watch closely.